Portugal possesses some of the earliest and finest examples of Neolithic structures in Europe. Portugal has been continuously inhabited since at least the Mesolithic times as demonstrated by the cave systems in Evora In addition to having the earliest stone-circle in Europe, it is also home to examples of 'Ogham' script, Spiral rock-art, Shell-middens and a range of megalithic structures including Stone circles, Dolmens, Passage mounds and even cart-ruts (occasionally referred to as 'Strada's Real'). More recently, Portugal hosted the Templar's conversion to the 'Order de Christo'. The 'Orca' complex (Mondego river). (Full List of Portuguese Megaliths). The recent report by the President of the APIA has opened the floodgates to the perception of prehistoric activity on the islands. 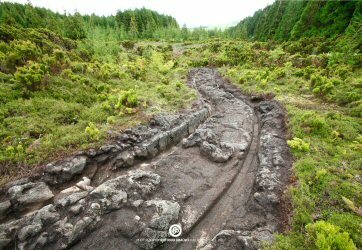 With archaeological discoveries having been made on most of the nine islands including cart-ruts, Hypogea and inscriptions, there is now no doubt that they were occupied in the prehistoric past, the question now is by whom?. Similarities to Greek and Carthaginian remains are of particular interest as coins from the same period had been rumoured to have been previously discovered on the island of Corvo. Located near Evora in the Alentejo has the largest stones of any passage-mound in all of Portugal, and possibly all of Europe. The stones extend over 7m above ground and the whole construction was covered by with a mound on-par with Maes-howe or the Irish passage-mounds at the Boyne Valley. The style of the structure is unique to central Portugal, although smaller versions can be found at both Commenda da Igreja and Anta do Tapadao. Zambujeiro is one of Portugal's treasures and a must for all lovers of megaliths. Spiral-rock-art - The photo (right), is from a rock in the region of piodáo in the Bieras. 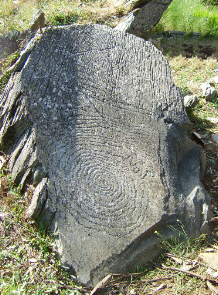 The lines of the spiral continue to form the shape of an animal (suggested as a horse), and then cut back and forth across the face of the rock, ending/starting in a depression (possible cup-mark). 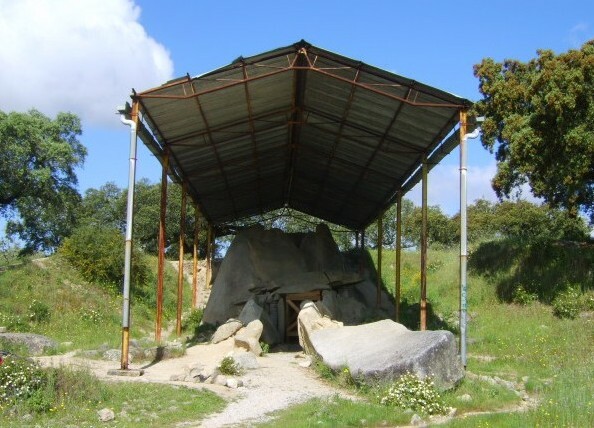 The elevated granite bedrock of the Fiais region near Carregal do Sal, offered the builders of the 'Orca' dolmens both a ready source of building material, and a 360˚ view of the country extending several miles in all directions, whilst remaining in close proximity to the Mondego river. 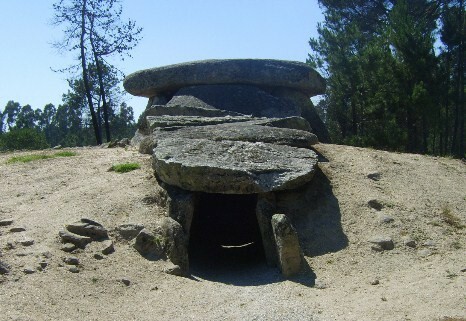 The several dolmens in this area have been preserved and combine together to form the 'Curcuito Pre-historico Fiais', a signposted journey through the forest tracks of Fiais. Apart from the beautiful Orca dolmen, this circuit offers examples of rock-art (arte-rupestre), several other smaller dolmens, and various other traces from Neolithic life, all of which add to the feel of the site. The countryside around Evora is rich with megaliths of all kinds. This region of Portugal offers some of the biggest and the best sites in Iberia. There are only two latitudes in which the Moon's maximum declination is the same as the latitude, meaning that at its maximum elongation it goes through the zenith (directly overhead). These two latitudes are 38˚ 331 N (Almendres), and 51° 10' N (Stonehenge). Recent discoveries of astronomical alignments between sites, support the idea that the Evora was important in prehistory.. This menhir, the largest in the Iberian Peninsula, stands just over 7m high with a 1.25m girth and illustrates the importance of the area in prehistoric times. It was re-erected in 1995 by the Portuguese heritage. Apparently its height is due to the fact that it belongs to a line of menhir's which were carefully arranged so that each one was visible from the next (The Menhir of Meada stands in a lower elevation than the others) (2). The beautiful landscape surrounding Monsaraz is home to several large Menhirs and the Xerez stone-circle, which was moved onto higher ground following the development of the Alqueva dam, which flooded much of the surrounding landscape when it was constructed in 2002. The circle was relocated around the already extant menhir by the Convento de Orada. Although this has enabled us to enjoy the presence of this ancient monument, it has lost its context in terms of its relationship with the landscape into which it was originally placed. Although there are numerous 'passage mounds' in Portugal, there is only one that appears to have been completely covered, (Zambujeiro, above), with most appearing to have been only 'half' covered in a style unique to the Iberian peninsular. Apart from having one of the largest mounds in Europe, Zambujeiro certainly has the largest interior stones of any passage mound in Europe. In all of the above structures (and common across Portugal), the chambers are composed of 7 large upright stones, the one covering the front supported by the first stones of the passage leaving it open and accessible. Also common to many Portuguese dolmen's or 'anta's is the destruction of the top half of one the right-hand (eastern) upright, as seen below. 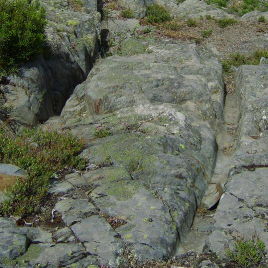 This as-yet unexplained feature was possibly the result of the 'de-paganisation' of megaliths and can be seen at prominent sites such as Orca, Tapadao, Fonte Coberta, Rio Torto, the Alleé couverte at Cunha Baixa and numerous others. Northern Portugal - There are only relatively few megalithic monuments compared with southern Portugal, but those that remain show the same fingerprint as their southern counterparts. There are several small-medium sized 'Anta's' with 7 uprights, covered with a large capstones, generally flattened on the underside. Anta da Fonte Coberta. 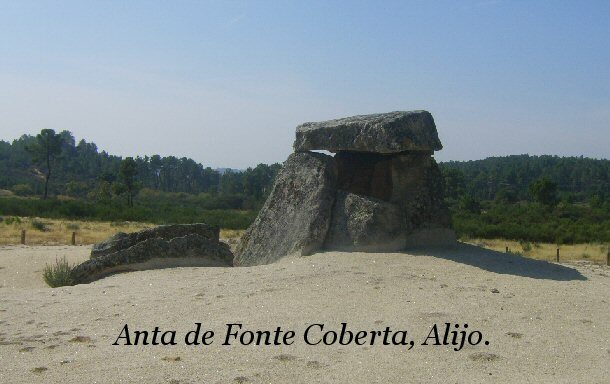 One of the nicest Anta/Dolmens in North Portugal. The Mondego river, Serra d'estrela - (Northern-central). The modern entrance to Spain from Northern-central Portugal appears to follow a similar prehistoric route, judging from the high density of prehistoric remains. One of several Neolithic concentrations in Portugal, sites are dotted along the River Mondego which follows the Serra d'estrela mountain range. Nearby this ancient and seemingly invisible route is the valley region of Piodao, near which several important prehistoric discoveries have been made such as the 'Orca' cluster. As well as having several impressive dolmens, passage-mounds and cart-ruts, this area has produced numerous prehistoric stone-carved Phallus' along riverbeds, over 50 examples of rock-art including spirals, foot-prints, and various other symbols and motifs, is gradually revealing itself to have been an important megalithic centre. Cart-Ruts (Strada's Real). Cart-rut's over the Serra's. Cunha Baixa. Allee couverte. (exposed passage mound). The 'Orca' complex. Prehistoric circuit including the great 'Orca dolmen'. Piodao Spiral(s). The largest rock-cut spiral in Europe. 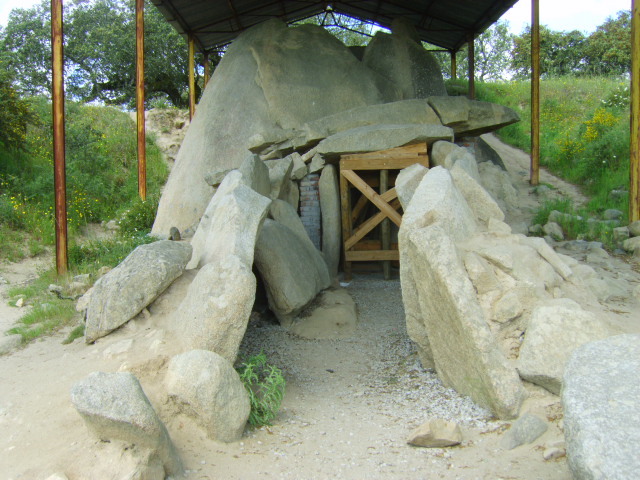 Rio Torto dolmen. 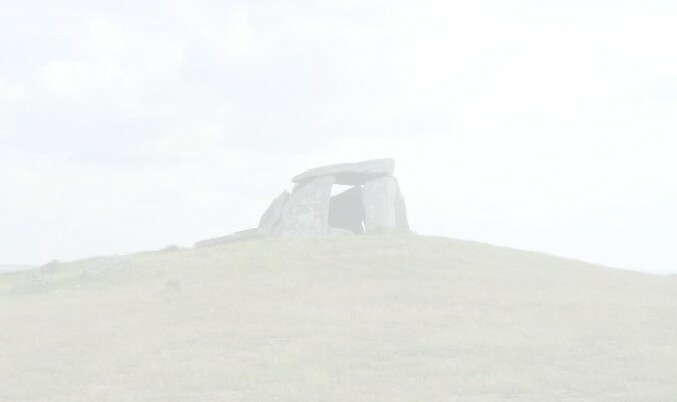 Classic Anta/Dolmen. Castelo de Vide, Portalegre - (Central East Portugal). 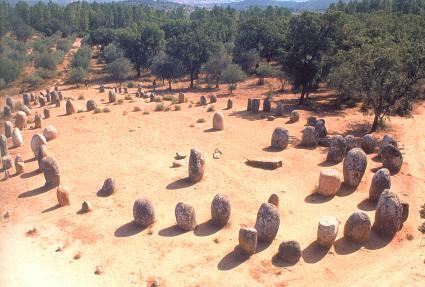 This area is mountain range is surrounded by numerous megaliths, including the Menhir de Meada, one of the largest standing stones in all Iberia. Parque Megalitico dos Coureleiros. Single track with four Anta/Dolmen in varying condition. Menhir de Meada. 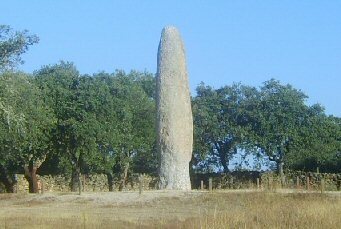 The Largest Menhir in all Iberia. San Gens, Anta de. 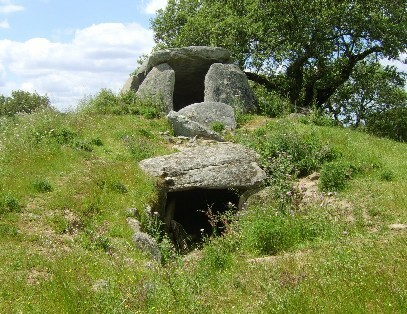 Small dolmen near Portalegre. Massive modern dolmen in town. Tapadão, Anta do. Dolmen/Passage mound near Portalegre. Almendres Circle and Standing stone. Near Evora. Two stone circles, Menhir. Commenda da Igreja Dolmen/Passage mound near Evora. Gruta Do Escoural Near Evora. Pre-historic cave art from 18,000 B.P. Anta Capelo de Sao Brissos. Christianised Dolmen near Evora. Pilgrimage site. 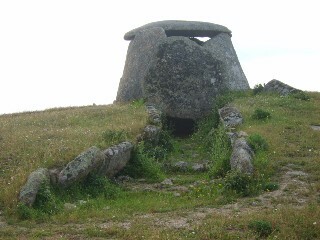 Sao Dinis Dolmen. The huge Christianised Dolmen in Pavia. Monsaraz Complex. 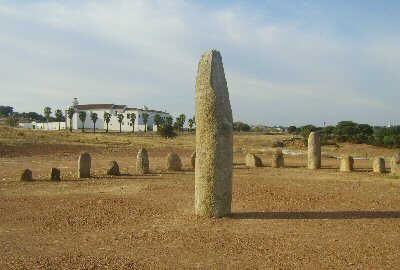 The Xarez stone-'quadrangle', Menhirs Outeiro and Bulhao. Zambujeiro, Anta Grande. Largest passage mound in Portugal, near Evora. 1). Cope, J. The Megalithic European. 2004. Harper Collins publ.